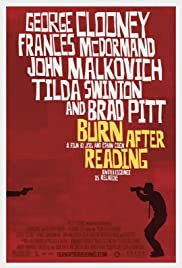 BEFORE: For the second Coen brothers film and other part of today’s double feature is another comedy, Burn After Reading. It stars a few Coen regulars including Frances McDormand from Raising Arizona earlier today and George Clooney (new to the marathon) in addition to Brad Pitt (last seen in Meet Joe Black) for which this film is his first Coen brothers experience. AFTER: Now this is more like it: a funny, engaging, and suspenseful film that had me hooked right from the opening scene. As I said earlier today in my review of Raising Arizona, the Coen brothers create unique and very complex characters which are at the core of their films. The other stuff is nice and is present in Burn After Reading, stuff like the great cinematography and stellar production design, but the characters and the actors who play them are what stands out. There is a wide variety of characters and each of them plays a key role in the film. J. K. Simmons as the CIA superior and David Rasche as Palmer lead the way in comedy. They only had a handful of scenes sprinkled throughout the film, but each time they appeared, it was instant laughter. Also on the comedic side was Brad Pitt who nailed the performance of Chad Feldheimer. Pitt broke the tension of some of the more dramatic scenes. In particular, his reaction in his last shot is priceless and is one of my favorite parts of the movie. Rounding out the film are George Clooney as Harry Pfarrer and John Malkovich as Osbourne Cox. While not as comedic as the other characters, their performances sold the tension and ongoing suspense of the film. The film did fall a tad short though and that was in the story department. Much better execution, especially compared to Raising Arizona, but it felt as though something was not explained. Throughout the film there is an air of mystery and you’re not sure what’s going on. The cinematography helps here as there are many point of view shots which give the viewer the sense that one of the characters is being watched/observed secretly. And the Coens do a good job with explaining things piece by piece, never giving too much away at once. And as much of a fan of ambiguous endings as I am (my films tend to have many of those), Burn After Reading just felt incomplete. Many things were explained, or otherwise resolved, but there are a handful of things that are left unexplained and hanging around. Burn After Reading is full of suspense and intrigue while still being funny and witty. It has one of the best ensemble casts I have ever seen and the production value compliments it very well. There are some minor plot problems but they are easily overlooked and forgotten you are drawn in by some fantastic acting. I’d say a must-see for Coen brothers fans and a should-see for everyone else.